This year I haven't played as many games as I have wanted to, I think having vertigo played a huge part in this as I wasn't able to look at a screen without feeling like I was going to throw up. I still suffer from it but right now it's under control and not making my NCS as bad as it usually does. On twitter I asked if I should do a post on my favourite games I've played this year, obviously it's going to be a mix of old and new games as I'm not the kind of person to just stick with playing the latest releases. What I did realise this year was how much of a mix of genres I enjoy playing, I feel like I've started to be more confident in what I play and what games I discuss on here. Horizon Zero Dawn is top of my list, I know a few people have been waiting for me to talk about it on here so It's about time I mention it. I started to play HZD a few months after it was first released and could tell straight away that I would enjoy it, not only was the main protagonist a ginger like me but she is a bloody badass in so many different ways. I think her being a redhead is a huge thing for those of us bullied and picked on for our hair colour. 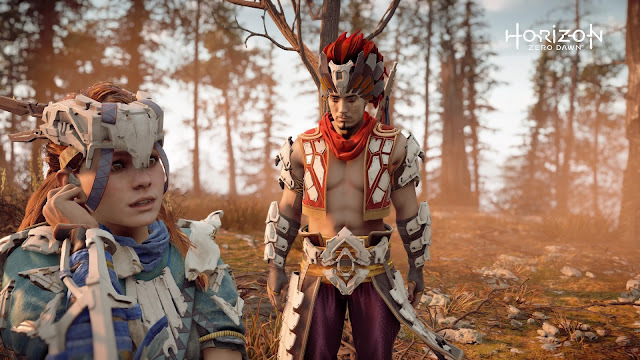 HZD is about a young girl named Aloy who became an outcast of the Nora tribe since birth, luckily for Aloy, another outcast named Rost took Aloy in and raised her as his own. Whilst she was out exploring one day she came across a device named a focus which gives her the ability to perceive the world differently and a little more clearly, this device has a lot more to do with the game than just helping her focus on things and in a world where humans must try to use technology to their advantage as well as fight against technology I initially thought the Focus could have turned out to be something bad. 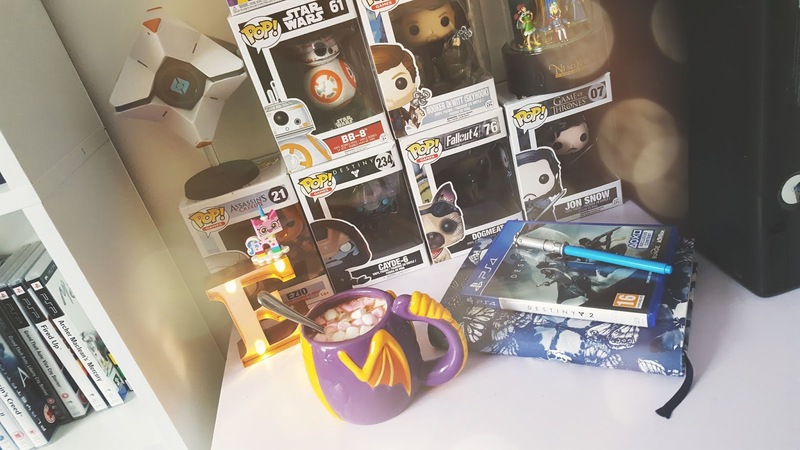 Those of you who love Life is Strange, you will be pleasantly surprised to find out that Ashly Burch who voiced Chloe is also the voice of Aloy, it took me a while to realise I knew her voice from somewhere, her voice and attitude is a huge reason why she is my favourite protagonist of this year, she is a beautiful and strong-minded young lady who literally fights to find out who she really is and where she really comes from. Once I finally do get around to completing the game I plan on doing a proper review as it's blown me away so far. 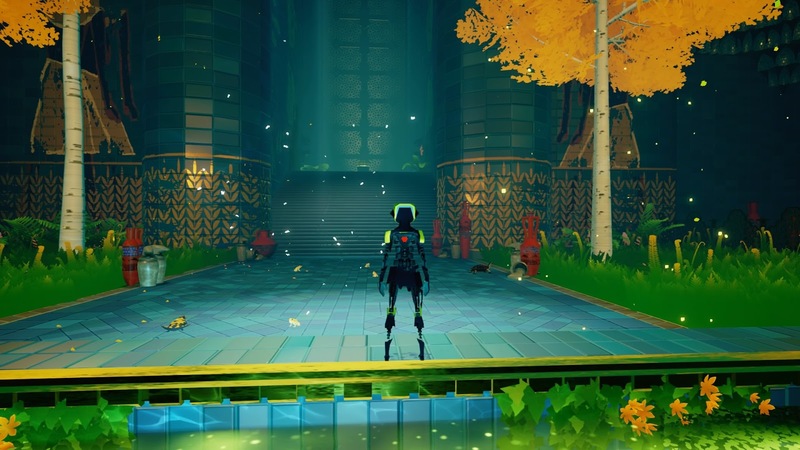 The way they have been able to create a world that is not only set in the old ways but also mixed with tech is stunning, there is so much that you can do and lots of side quests to keep you busy and help you level up in order to get further into the storyline. This game is visually and musically stunning, I finally gave in and bought it this year after watching lots of gameplay of it, people were right that once I play it myself I will get even more enjoyment out of it rather than just watching it. it took me all of a few hours to complete that's with me trying to get all the trophies too, although I was a bit disappointed with there not being a platinum trophy as I do love getting them even though I only have 3 right now. Before I played this game I did a piece on it got The Last Life Club and it was included in my top 4 aesthetically pleasing games but based on gameplay, obviously now I have played it myself I can definitely say how relaxing and pleasing it truly is. I don't want to compare it to Journey but if any of you have played Journey you will love Abzû, it's like a mixture of Ecco the Dolphin and Journey together except it's underwater it a vast and beautiful world full of life and wonder. 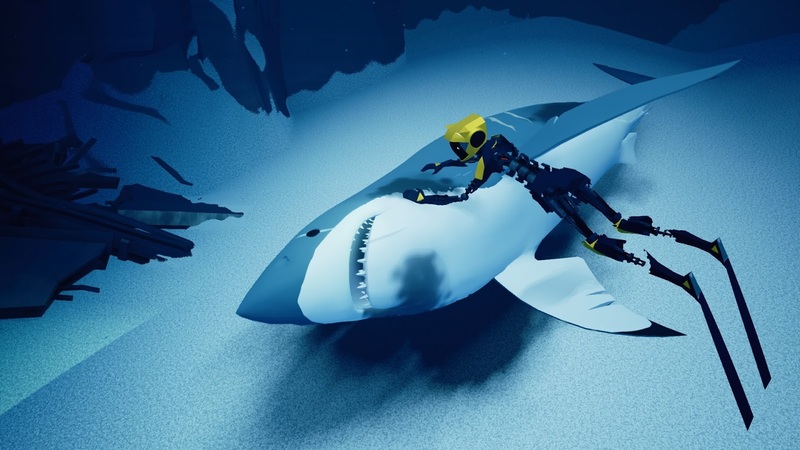 Abzû focuses on exploring and finding your way through underwater ruins whilst solving puzzles and even meditating, you play as a diver and everything around you including yourself is in abstract form which to me makes it more pleasing on the eyes which makes it the kind of game you can just sit and chill out playing, the diver is actually female which I didn't know until recently, whilst playing as her you follow a shark and come across different parts which you can bring life to by using the energy that comes from within her, kind of like using mucical notes to make ribbbons grow in Journey, you will find that the diver holds the key to restoring life under the ocean and with the help of her friend succeds. Along the way, there are collectables which you need to find as well as meditation spots finding them will help you get trophies! This was another game I didn't get to finish only because of one glitch but I'm going to purchase it for myself so I can complete it but that doesn't take away from the fact that it's a great game. 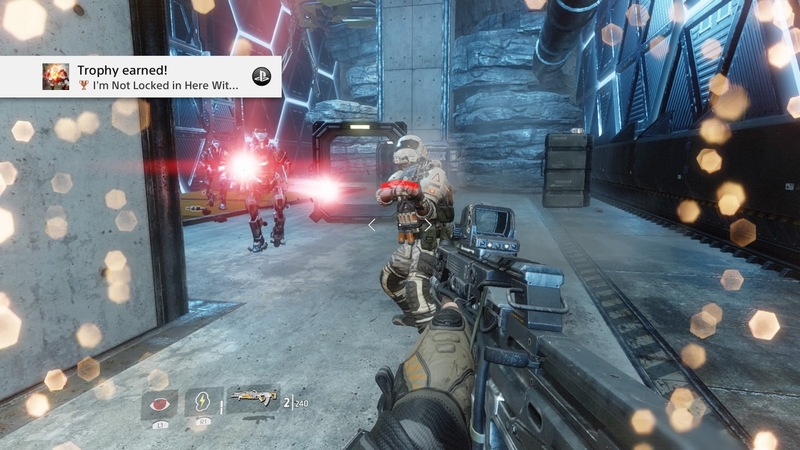 For those who love robots and fighting this is a great game to try out, I was grateful that the start of the game came with a proper tutorial, I got into the swing of things really quickly and found the weapons really easy to use, I'm terrible at aiming and firing normally. When I told a friend I was borrowing Titanfall 2, he said that if I enjoyed the Gears of War games I will most likely like Titanfall 2 as they are both weapon heavy which I love in a shooter game. There is both a campaign and multiplayer option in this game I played through the campaign as I'm not a huge multiplayer fan so I cant delve into what it's like but if it's anything a fun as the campaign then I would probably give it a go. 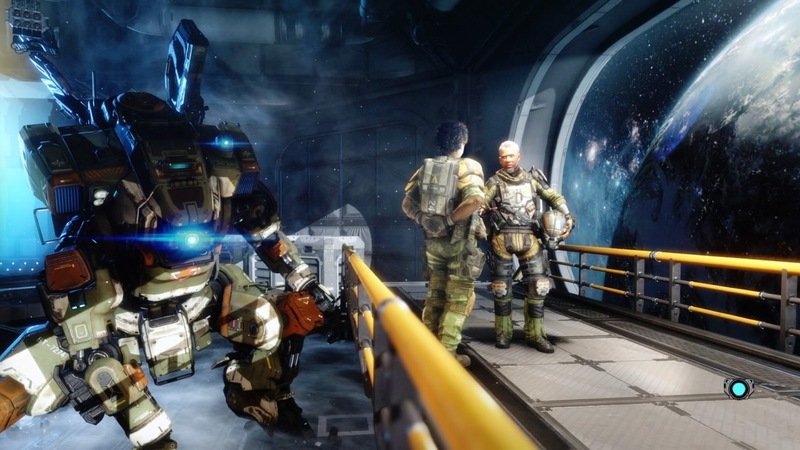 Respawn did a great job in making each campaign levels creative and stand out, I enjoyed being able to work with a Titan in order to fight the enemies and hate to say it but the movie Edge of Tomorrow reminded me so much of Titanfall 2. The game is about a guy named Jack Cooper who wants to become a Titan pilot, you play as Jack and as I mentioned before you go through the tutorial as him learning what you need to know about shooting and using a Titan, the commander who helps you in the tutorial is eventually killed in front of you but before he dies he transfers the command of his Titan known as BT over to you. BT and you are both stranded and have to come together in order to get yourself out of the sticky situation you have found yourselves in, I love the mechanics of the game as a whole and need to restart it (again) in order to get past the glitched part of the game, not sure why it did it but I will happily play through it again as I was enjoying it so much. 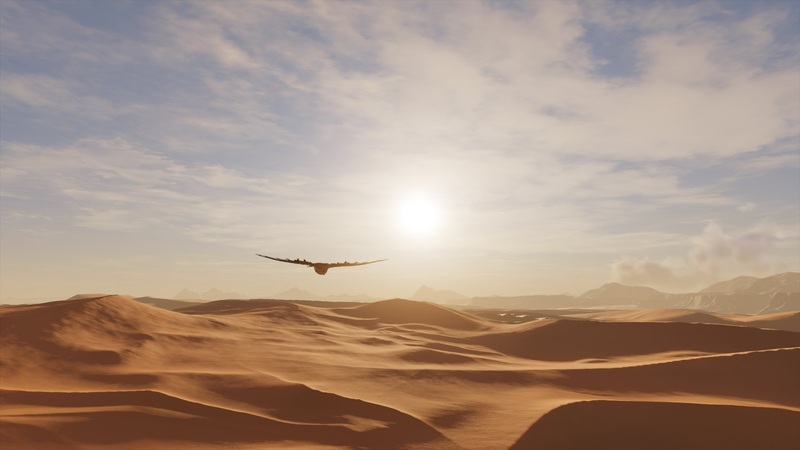 Last but not least has to be Assassin's Creed Origins, I'm so so pleased with how this game has turned out the story is wonderful, I still need to complete it but I know how it ends as I watched James play and finish it. 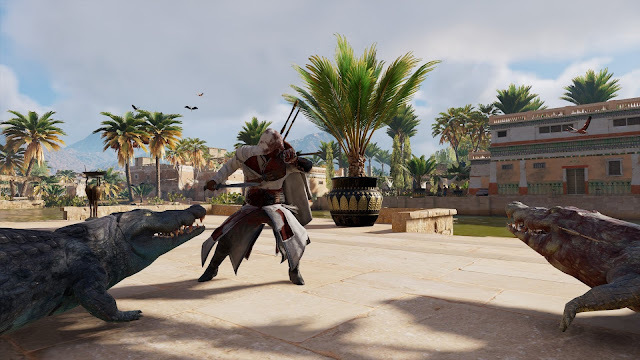 Bayek has become another favourite Assassin of mine and what happens to him and his wife broke my heart. 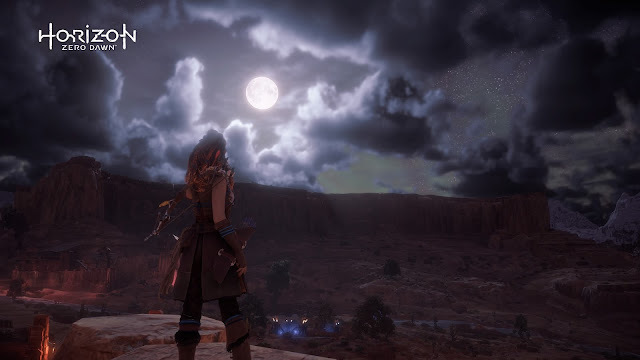 Ubisoft made this game better than I ever hoped, it even has a photo mode so I can press L3 and R3 and frame the picture just the way I want it (yes I'm aware HZD has a photo mode too). I've spent hours playing through side missions and levelling up and actually enjoyed it, the fighting style has changed a lot and you will have control over an eagle called Senu rather than using eagle vision via your character. You are even able to play as Bayeks wife Aya and control a ship, I really enjoyed doing these quests and it made a nice change to see her character more up close and personal. I feel that the map in Origins is packed full of a lot more than previous maps and more pleasing on the eye, I found myself just wondering around in photo mode taking pictures of the stunning sky and sea. For those who are sick of the animus you will be disappointed to learn there are moments where you come in and out of the animus but this time you are a female researcher called Layla, there aren't that many scenes to do with Layla and the game concentrates a lot more on Bayek seeking revenge for his son's murder. As someone who hated Desmond, I was worried I wouldn't like Layla as much but, to be honest, she is a cool character and if they do make another Assassin's Creed I would like to see her in it again. Seeing as this game is still very new and a lot of people haven't played it I won't go in on any more details except tell you that AC Origins really does explain the origin of the Assassin's and how the Brotherhood was formed. 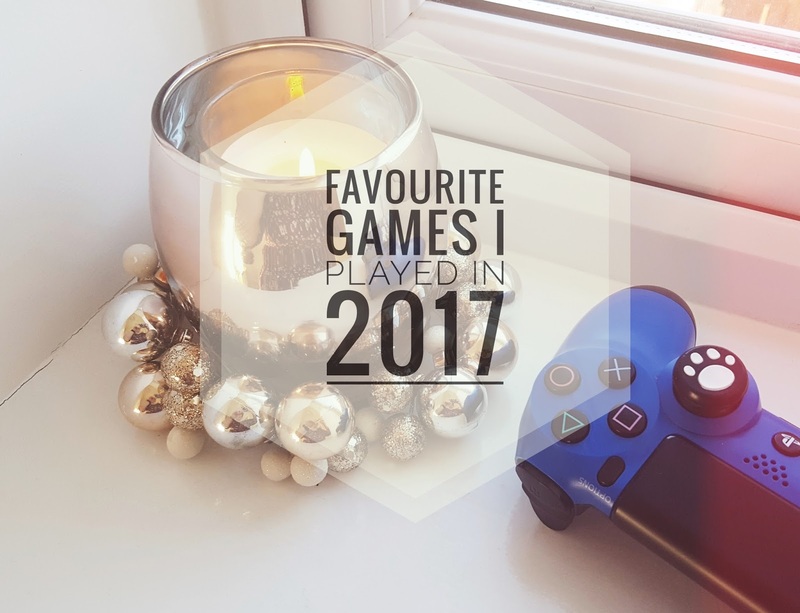 What has been your favourite game(s) to play this year?